We are having our first daughter very very soon! As you can imagine, after two boys I am so ready to spoil her with all things fancy, fuzzy, and girly! In fact we are working on her nursery this weekend and I am so excited to add her to it! Recently, Max Daniel Designs sent me the most luxurious blanket for the princess that is so soft and amazingly snuggly. We are talking top quality baby blanket here, that I know will be her favorite when she is born. It is most certainly my favorite of all the baby blankets we have so far! 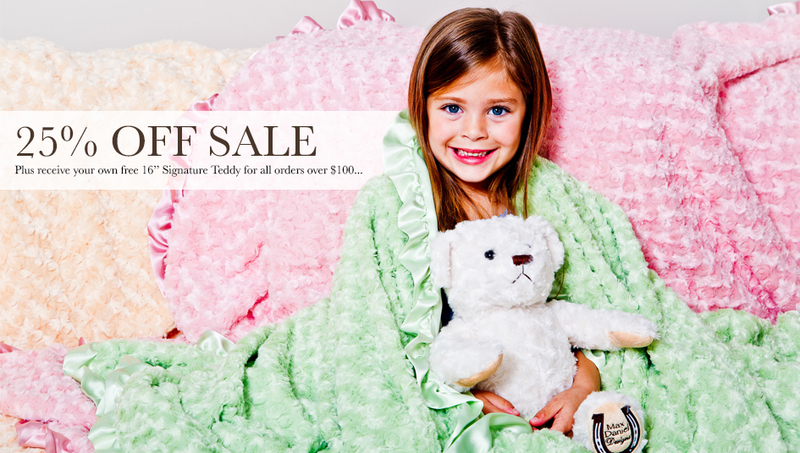 The Max Daniel Baby Blankets Collection features luxurious, ultra-soft and cozy baby blankets and security blankets that are machine washable and made in the USA. A favorite among fine boutiques, showrooms and celebrities’ children across the world. Max Daniel is home to the world’s cuddliest luxury blanket, guaranteed to soothe and comfort your baby! Our signature lines include Animal Prints, Rosebud & Satin Prints and Plus Dots Prints. Because we have a color and a pattern to complement any nursery, our high-end blankets make ideal baby shower gift ideas or for any other occasion that calls for luxury baby items. Moms around the world have told us time after time that they would rather spend their money on a unique, quality, expensive baby blanket than on a cheap version that will last only a few years. Doesn’t your baby deserve the best? I am in love with out blanket and cannot think of a better present for any baby shower than this! Especially for fall or winter born babies, when they need something thicker and warmer than the traditional baby blanket. Max Daniel Designs also has so many amazing patterns and offers adult blankets and smaller matching security blankets as well! What a cute set that would make to give someone on the arrival of their precious new one. Max Daniel just turned 11 and to celebrate we’re having a special 25% OFF BIRTHDAY SALE! In lieu of presents and cake, we’re giving all our fans 25% OFF ALL ROSEBUDS & SATIN baby blankets and securities, as well as adult throws. But that’s not the only treat we have for our treasured customers. In addition, all orders over $100 will receive our new 16-inch TEDDY BEAR as a FREE GIFT! As always, we’re giving you FREE SHIPPING on orders over $85!! Enter: MD2015BDAY25OFF at checkout. Giveaway: Please note this giveaway takes place on a third party website and is in no way associated with Top Notch Material, and we are not responsible for prize fulfillment. ENTER HERE.